Pamphlet of 16 pages, celebrating the 200th anniversary of Guinness. 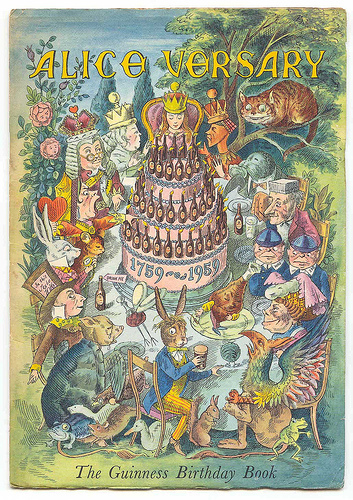 Printed by W. S. Cowell Ltd, Ipswich. Guinness began sending promotional booklets to doctors in 1933, breaking off during World War 2, and restarting again in 1950. In all, 24 were made, of which five are based on the Alice books: this is the last of the five. 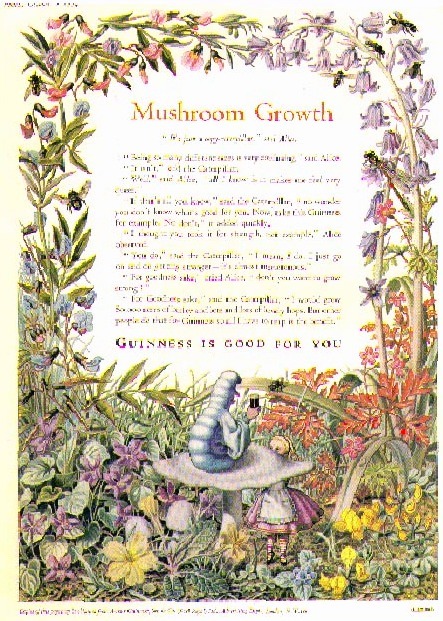 All of the booklets were produced by the advertising agency SH Benson, who were also responsible for many of the iconic Guinness ads of the period. Ronald Ferns (14 October 1925 – 2 December 1997) was an English illustrator, designer, cartoonist and surrealist painter in both oil and watercolour. After training at St. Martins in London, his first major official commission was a vast mural for the 1951 Festival of Britain for the Milk Marketing Board. In the same year, he was also commissioned to create the scenic design for the premiere of Fate’s Revenge by the Ballet Rambert. He later produced children’s books including The Learned Hippopotamus (1986), Caterpillar Stew (1990) and Like It Or Not (1992. ‘It must, I fear,’ said Alice, ‘Be something that I ate – I’m opening like a telescope at an alarming rate! And yet I can’t help thinking how useful necks like these would be in any Wonderland where Guinness grows on trees’. 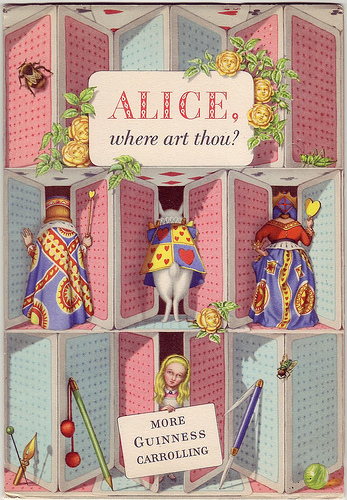 Tags: advert, Advertising, alice, Alice Where Art Thou, Alice Where Art Thou? 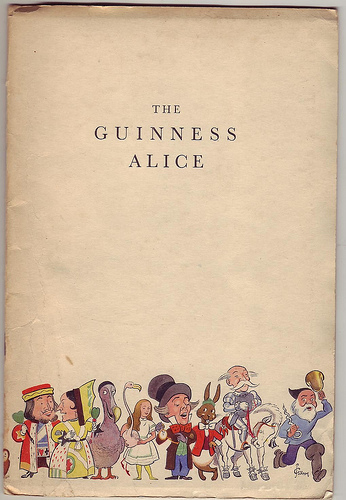 More Guinness Carrolling, Antony Groves-Raines, Guinness, John Waddington Ltd, More Guinness Carrolling, The Guinness Alice, Where Art Thou? (More Guinness Carrolling). Alice, Where Art Thou? (More Guinness Carrolling). Pamphlet with 16 stapled pages. Illustrations by Antony Groves-Raines, who was also involved in designing posters for the Underground. In all, 24 were made, of which five are based on the Alice books: this is the fourth of the five. 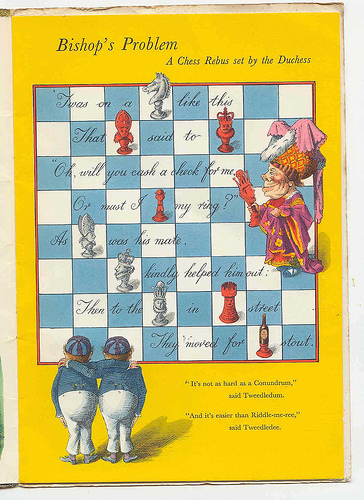 All of the booklets were produced by the advertising agency SH Benson, who were also responsible for many of the iconic Guinness ads of the period. 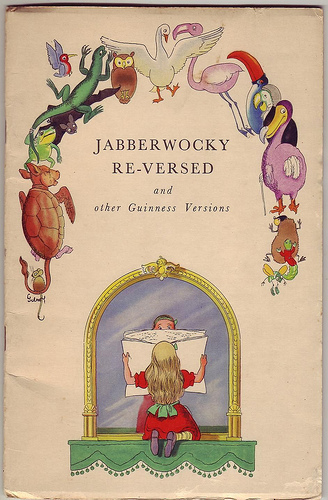 There are parodies of episodes from both Alice books, and from The Hunting of the Snark, along with Alice finding herself in new situations such as Alice in Snowmansland and Alice in Posterland. 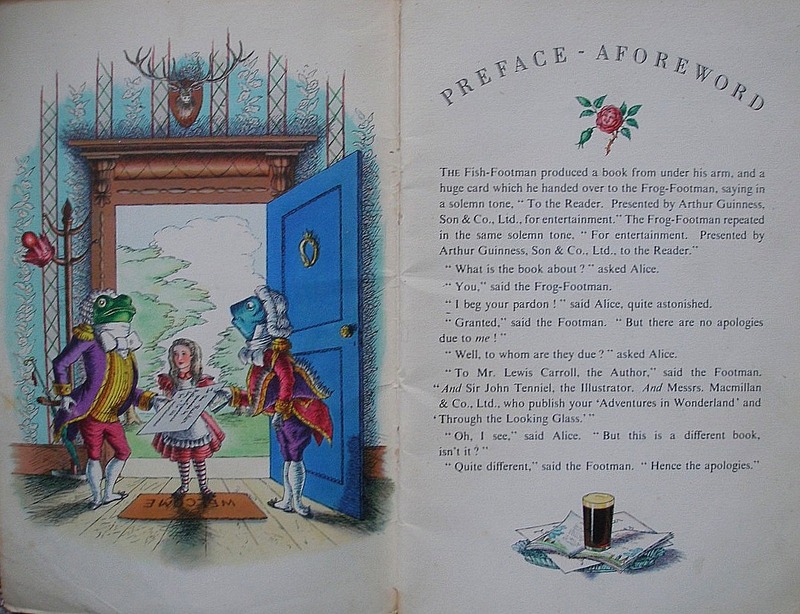 My copy was bought fairly cheaply on ebay: you might be lucky and do the same, or you can usually find it for around the 80 quid mark on abebooks or amazon: Alice, where art thou? Guinness began doing this in 1933, carried on until World War 2 halted the practice, and they only started again in 1950. The booklets were then produced each year until 1966. They were produced by the advertising agency SH Benson, who made many of the iconic Guinness ads. 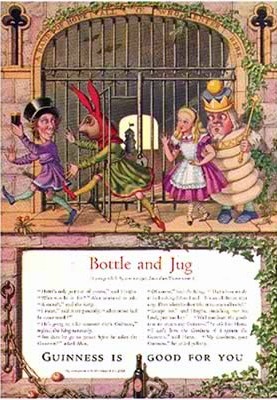 This was the second of the booklets that was based on Alice. The head that aches, the limbs that flag! But then the clock struck one! Oh welcome chime! Tis Guinness time! His thirsty lips went smicker-smack! “And hast thou vanquished Summer-flop? My son, you know what’s good for you!